Abdul Latif Jameel Poverty Action Lab (J-PAL) - J-PAL researchers conduct randomized evaluations to test and improve the effectiveness of programs and policies aimed at reducing poverty. ACORN (Association of Community Organizations for Reform Now) - The largest low and moderate-income membership organization in the country, organizing the poor and powerless. Action - Citizen's lobby that identifies sustainable solutions to the problems of hunger and poverty. ActionAid - Works with poor and marginalised people to eradicate poverty by overcoming the injustice and inequity that cause it, assisting in 40 countries in Africa, Asia, Latin America and the Caribbean. Advocates for International Development (A4ID) - A global charity that believes the law can, and should, be used more effectively to eradicate global poverty. Works to ensure legal support is available for all those involved in the fight against poverty and that lawyers and development organisations have the skills and knowledge to use the law as an effective development tool. Alliance of Californians for Community Empowerment (ACCE) - A multi-racial, democratic, non-profit community organization building power in low to moderate income neighborhoods to stand and fight for social, economic, and racial justice. American Jewish World Service (AJWS) - A not-for-profit nonsectarian organization founded to help alleviate human suffering, poverty, hunger and disease among the people of the world regardless of race, religion or nationality. Arriba Juntos - A non-profit, career development agency located in the Mission District of San Francisco. Arriba Juntos helps find secure, permanent jobs that lead to a better standard of living and lasting self-sufficiency for people of color and low-income. Asian Development Bank (ADB) - ADB is a multilateral development finance institution dedicated to reducing poverty in Asia and the Pacific. ADB is owned by 67 members, mostly from within the Asian and Pacific region. Basic Income Earth Network (BIEN) - Promoting basic income, conceived as a universal and unconditional, if modest, continuous stream of income granted throughout life to all members of a political community. Boycott Workfare - A UK-wide campaign to end forced unpaid work for people who receive welfare. Workfare profits the rich by providing free labour, whilst threatening the poor by taking away welfare rights if people refuse to work without a living wage. Boycott Workfare exposes and takes action against companies and organisations profiting from workfare; encourage organisations to pledge to boycott it; and actively inform people of their rights. Brookings: Inequality - Brookings Institution research. CAFOD - The official Catholic aid agency for England and Wales. California Reinvestment Committee (CRC) - Seeks to revitalize California's low-income and minority communities by increasing access to credit and deposit services. Canadian International Development Agency (CIDA) - Support foreign aid projects in more than 100 of the poorest countries of the world. CARE International - Non-sectarian relief and development organizations. CARE USA - CARE is one of the world's largest private international humanitarian organizations, committed to helping families in poor communities improve their lives and achieve lasting victories over poverty. Founded in 1945 to provide relief to survivors of World War II, CARE quickly became a trusted vehicle for the compassion and generosity of millions. Caritis International - Caritas Internationalis is a confederation of 162 Catholic relief, development and social service organisations working to build a better world, especially for the poor and oppressed, in over 200 countries and territories. Carsey Institute, The - Conducts policy research on vulnerable children, youth, and families and on sustainable community development. Catholic Agency for Overseas Development (CAFOD) - A major British charity that has been fighting third world poverty since 1962. CAFOD is the English and Welsh arm of Caritas Internationalis, a worldwide network of Catholic relief and development organisations. Catholic Relief Services (CRS - USCC) - Catholic Relief Services was founded in 1943 by the Catholic Bishops of the United States to assist the poor and disadvantaged outside the country. Working through local offices and an extensive network of partners, CRS operates on 5 continents and in over 90 countries. They aid the poor by first providing direct assistance where needed, then encouraging these people to help with their own development. Together, this fosters secure, productive, just communities that enable people to realize their potential. Carter Center - Guided by a fundamental commitment to human rights and the alleviation of human suffering, the Carter Center seeks to prevent and resolve conflicts, enhance freedom and democracy, and improve health. Center for an Urban Future - A public policy organization dedicated to improving the overall health of New York City and serving its long-term interests by targeting problems facing low-income and working-class neighborhoods in all five boroughs. Center for Community Change - Helping low-income people build powerful, effective organizations. Center for Global Development (CGD) - Works to reduce global poverty and inequality through rigorous research and active engagement with the policy community. Center for New York City Affairs at The New School - An applied policy research institute that drives innovation in social policy. The Center focuses on how public policy impacts low-income communities. Center on Budget and Policy Priorities - Research organization and policy institute that conducts research and analysis on government policies and programs, with an emphasis on those affecting low- and moderate-income people. Center for Global Development (CGD) - Dedicated to reducing global poverty and inequality through policy oriented research and active engagement on development issues with the policy community and the public. Center on Policy Initiatives (CPI) - A nonprofit research and action institute dedicated to advancing economic equity for working people and diverse communities throughout the San Diego region. CPI works to increase access to good jobs and quality healthcare, and to improve conditions for low-wage workers and families. Center on Urban Poverty and Community Development - Seeks to address the problems of persistent and concentrated urban poverty and is dedicated to understanding how social and economic changes affect low-income communities and their residents. Child Poverty Action Group (CPAG) - UK organization that provides information about low-income families and the policies that affect them. Monitors official poverty statistics and carries out research, providing evidence of the shortcomings of the social security and tax credits systems in regular briefings to government ministers, MPs and the general public. Children's Defense Fund (CDF) - CDF educates the U.S. about the needs of children and encourages preventive investment before they get sick or into trouble, drop out of school, or suffer family breakdown. Childwelfare - Gateway to child welfare resources. Christian Aid - An agency of the churches in the UK and Ireland, Christian Aid works wherever the need is greatest, irrespective of religion. Christian Aid believes in strengthening people to find their own solutions to the problems they face. It strives for a new world transformed by an end to poverty and campaigns to change the rules that keep people poor. Coalition on Human Needs Campaign (CHN) - CHN is an alliance of national organizations working together to promote public policies which address the needs of low-income and other vulnerable populations. Coalition members include civil rights, religious, labor and professional organizations and those concerned with the well being of children, women, the elderly and people with disabilities. Commonwealth Institute for Fiscal Analysis - Provides information and analyses of fiscal and economic issues with particular attention to the impacts on low- and moderate-income persons. Community Voices Heard - A member organization of low-income people, predominantly women with experience on welfare, building power in New York City and State to improve the lives of families and communities. Consultative Group to Assist the Poor (CGAP) - An independent policy and research center dedicated to advancing financial access for the world's poor. It is supported by over 30 development agencies and private foundations who share a common mission to alleviate poverty. Housed at the World Bank, CGAP provides market intelligence, promotes standards, develops innovative solutions and offers advisory services to governments, financial service providers, donors, and investors. Corporation for Enterprise Development (CFED) - Working at the local, state and federal levels to create economic opportunity that alleviates poverty. DC Fiscal Policy Institute - Conducts research and public education on budget and tax issues in the District of Columbia, with a particular emphasis on issues that affect low- and moderate-income residents. Development Gateway - Helps communities, organizations, and individuals build partnerships, share ideas, and work together to reduce poverty. DrawBridge - An arts program for homeless children in San Francisco. Earth Institute at Columbia University - Brings together talent from throughout the University to address complex issues facing the planet and its inhabitants, with particular focus on sustainable development and the needs of the world's poor. The Earth Institute is motivated by the belief that science and technological tools already exist, and could be expanded, to greatly improve conditions for the world's poor while preserving the natural systems that support life on Earth. Economic Hardship Reporting Project - Investigative journalist Barbara Ehrenreich and the Institute for Policy Studies have launched the Economic Hardship Reporting Project to force the crisis of poverty and economic insecurity to the center of the U.S. conversation. Economic Roundtable - Non-profit, public benefit corporation organized to conduct research and implement programs that contribute to the economic self-sufficiency of individuals. Emergency Food and Shelter National Board Program (EFSP) - Created to supplement the work of local social service organizations, both private and governmental, to help people in need of emergency assistance. End Child Poverty (UK) - Promotes the case for ending child poverty in the UK by 2020. Gandhi Worldwide Education Institute (GWEI) - GWEI has organized a multi-pronged rogram to help eradicate the scourge of poverty and human degradation. Gandhi said: "Poverty is the worse form of violence," and must be tackled on all fronts to ensure human rights and human dignity to those who are victims of societal exploitation. The priority of the Institute is to rescue children from the poorest sections of Indian society who are the first to become victims of criminal gangs; the second priority is to build an institution that serves as a shelter as well as a learning institution where the rescued children will receive basic education. Global Citizen - A social action platform for learning about issues and joining a community committed to social change. Working to end extreme poverty. Global Development: Views from the Center - Features posts from Nancy Birdsall and her colleagues about innovative, practical policy responses to poverty and inequality in a globalizing world. Global Fund to Fight AIDS, Tuberculosis and Malaria - Funding the fight against the diseases of poverty. Growing Gap Updates - An initiative of the Canadian Centre for Policy Alternatives' Inequality Project, a national project to increase public awareness about the alarming spread of income and wealth inequality in Canada. Halifax Initiative - A Canadian coalition of development, environment, faith, rights and labour groups whose goal is to contribute to the fundamental transformation of the international financial system and its institutions to achieve poverty eradication, environmental sustainability and the equitable re-distribution of wealth. Heartland Alliance - One of the world’s leading anti-poverty organizations, works in communities in the U.S. and abroad to serve those who are homeless, living in poverty, or seeking safety. Provides services in the areas of health, housing, jobs and justice. How to Improve Poverty Measurement in the United States (Rebecca Blank, Brookings Institution) - Prepared as the Presidential Address to the Association for Public Policy Analysis and Management at their annual conference, November 8-10, 2007. This paper argues that working to change the current OMB directive is not the appropriate place to expend effort. The current poverty measures are what they are, imbedded inside a necessarily political agency which has many reasons to avoid change. We need to escape the argumentative box we have been in for several decades and assign responsibility for calculating a Revised Poverty Measure to an agency prepared to take on such a task. At the same time, we need to recognize the inherent limitations in any measure of income poverty. We should catch up with our European cousins and, like them, work to develop multiple measures of economic deprivation. Human Development Reports (HDR) - The Human Development Report is an independent report. It is commissioned by the United Nations Development Programme (UNDP) and is the product of a selected team of leading scholars, development practitioners and members of the Human Development Report Office of UNDP. Since the first Report, four new composite indices for human development have been developed - the Human Development Index, the Gender-related Development Index, the Gender Empowerment Measure, and the Human Poverty Index. 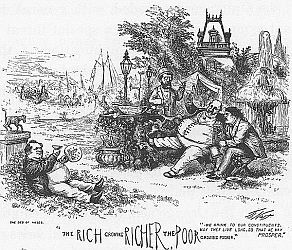 Inequality - Portal into all things online related to the income and wealth gaps that so divide us, in the United States and throughout the world. Innovations for Poverty Action (IPA) - A nonprofit dedicated to discovering what works to help the world's poor. Designs and evaluates programs in real contexts with real people, and provides hands-on assistance to bring successful programs to scale. Insight: Center for Community Economic Development - A national research, consulting, and legal organization dedicated to building economic health in vulnerable communities. InterAction - The largest alliance of U.S.-based international development and humanitarian nongovernmental organizations. With more than 160 members operating in every developing country, it works to overcome poverty, exclusion and suffering by advancing social justice and basic dignity for all. International Day for the Eradication of Poverty - The International Day for the Eradication of Poverty has been observed every year since 1993, when the General Assembly, by resolution 47/196, designated this day to promote awareness of the need to eradicate poverty and destitution in all countries, particularly in developing countries - a need that has become a development priority. International Finance Corporation (IFC) - Promotes sustainable private sector investment in developing countries as a way to reduce poverty and improve people's lives. International Fund for Agricultural Development (IFAD) - A specialized agency of the United Nations mandated to combat rural hunger and poverty in developing countries. International Water Management Institute (IWMI) - A scientific research organization focusing on the use of water in agriculture and on the water needs of developing countries. IWMI works with partners India, Pakistan, Sri Lanka, Mexico, the Philippines, Iran, Vietnam, China and Africa to develop tools and methods to help these countries eradicate poverty through more effective management of their water resources. Joseph Rowntree Foundation (JRF) - Determined to reduce poverty, and, if possible, end it. Jubilee Debt Campaign (UK) - Demands an end to the scandal of poor countries paying money to the rich world. Calls for 100% cancellation of unpayable and unfair poor country debts. Jubilee USA Network - An alliance of more than 75 U.S. organizations, 300 faith communities and 50 Jubilee global partners. Working for an economy that serves, protects and promotes participation of the most vulnerable. Least Developed Countries Reoprt - Assesses the relationship between international trade and poverty within the LDCs, and identifies national and international policies that can make trade a more effective mechanism for poverty reduction in these countries. Prepared by the Secretary-General of UNCTAD. Legal Services NYC - Fighting poverty and seeking racial, social, and economic justice for low income New Yorkers. Living Wage Calculator - MIT has developed this living wage calculator to estimate the cost of living in your community or region. The calculator lists typical expenses, the living wage and typical wages for the selected location. MAG-Net - A local-to-local advocacy network of grassroots community organizations working together for media change to end poverty, eliminate racism, and ensure human rights. Make Poverty History - Anti-poverty movement pressuring politicians and decision makers to make poverty history. Measuring Poverty: A New Approach (1995) - Each year's poverty figures are anxiously awaited by policymakers, analysts, and the media. Yet questions are increasing about the 30-year-old measure as social and economic conditions change. In Measuring Poverty a distinguished panel provides policymakers with an up-to-date evaluation ofConcepts and procedures for deriving the poverty threshold, including adjustments for different family circumstances. Definitions of family resources. Procedures for annual updates of poverty measures. The volume explores specific issues underlying the poverty measure, analyzes the likely effects of any changes on poverty rates, and discusses the impact on eligibility for public benefits. In supporting its recommendations the panel provides insightful recognition of the political and social dimensions of this key economic indicator. Measuring Poverty will be important to government officials, policy analysts, statisticians, economists, researchers, and others involved in virtually all poverty and social welfare issues. Media Mobilizing Project (MMP) - Exists to build a media, education and organizing infrastructure that will cohere and amplify the movement to end poverty. Uses media to organize poor and working people to tell their stories to each other and the world, disrupting the stereotypes and structures that keep communities divided. MercyCorps - A global aid agency engaged in transitional environments that have experienced some sort of shock: natural disaster, economic collapse, or conflict. People working for it move as quickly as possible from bringing in food and supplies to enabling people to rebuild their economy with community-driven and market-led programs. Millennium Challenge Corporation (MCC) - A United States Government corporation designed to work with some of the poorest countries in the world. Millennium Development Goals - The eight MDG which range from halving extreme poverty to halting the spread of HIV/AIDS and providing universal primary education, all by the target date of 2015 - form a blueprint agreed to by all the world's countries and all the world's leading development institutions. Millenium Project - Commissioned by the United Nations Secretary-General in 2002 to develop a concrete action plan for the world to reverse the grinding poverty, hunger and disease affecting billions of people. Millenium Villages - Addresses the root causes of extreme poverty by taking a holistic, community-led approach to sustainable development. To meet the many different challenges each region faces, the villages use multiple tools such as community health workers, diversified local food production, commercial farming, malaria control, piped water, solar electricity, and connectivity to name a few. These multiple tools are synergistic-while each has been proven to support its main target, each also contributes to progress on several or all of the goals. National Center for Children in Poverty - Identifies and promotes strategies that reduce the number of young children living in poverty in the U.S., and that improve the life chances of the millions of children under age six who are growing up poor. National Law Center on Homelessness and Poverty (NCLHP) - The mission of the NCLHP is to alleviate, ameliorate and end homelessness by serving as the legal arm of the nationwide movement to end homelessness. National Technology Assistance Project (NTAP) - Technology information for the poverty law community. Neighborhood Economic Development Advocacy Project (NEDAP) - A resource and advocacy center for community groups in New York City. Its mission is to promote community economic justice and to eliminate discriminatory economic practices that harm communities and perpetuate inequality and poverty. New Rules for Global Finance - A networking, idea generating, nongovernmental organization that seeks to promote stable global financial systems which reduce poverty and inequality. New Rules convenes activists and policymakers from developed and developing countries to identify and advocate politically feasible and technically sound solutions to systemic issues of international finance and resource mobilization which impede inclusive development. Office of Family Assistance (OFA) - OFA is located in the United States Department of Health and Human Services, Administration for Children and Families and oversees the Temporary Assistance for Needy Families (TANF) Program created by the Welfare Reform Law of 1996. Ontario Coalition Against Poverty (OCAP) - A direct-action anti-poverty organization based in Toronto, Ontario, Canada. Mounts campaigns against regressive government policies as they affect poor and working people. Provides direct-action advocacy for individuals against eviction, termination of welfare benefits, and deportation. Believes in the power of people to organize themselves. Oxfam International - Working to end the waste and pain of poverty. Oxfam International: Trade Campaign - Reminding the world leaders of their promises to make affordable medicines available to all. OPHI's Global Multidimensional Poverty Index - An international measure of acute poverty covering over 100 developing countries. It complements traditional income-based poverty measures by capturing the severe deprivations that each person faces at the same time with respect to education, health and living standards. Partners in Health - Healthcare for the poor. Coordinates programs to combat AIDS and women's health problems in rural Haiti and urban Massachusetts and tuberculosis in the prisons of Siberia and the shantytowns of Lima. Promotes global health policy initiatives directed to those most in need. Peter B. Edelman - Professor of Law at Georgetown Law. Writes, researches and teaches on poverty, welfare, juvenile justice, constitutional law, and legislation. Policies to Address Poverty - These proposals are authored by a diverse set of leading scholars, each tackling a specific aspect of the poverty crisis. Commissioned by The Hamilton Project at The Brookings Institution. Poor Magazine/Poor News Network (PNN) - A multi-media access project of Poor Magazine, dedicated to reframing news, issues and solutions from low and no income communities - providing society with a perspective usually not heard or seen within mainstream media. Poor People's Economic Human Rights Campaign - Building a movement that unites the poor across color lines. "Daily more and more of us are downsized and impoverished. We share a common interest in uniting against the prevailing conditions and around our vision of a society where we all have the right to health care, housing, living wage jobs, and access to quality primary, secondary, and higher education." Poor Press - Very low and no income adults and youth are given the opportunity to create a book from start to finish, beginning with creative writing, narrative essays and poetry and then progressing to graphic design and layout publishing and promotion. Written from the voice of youth, adults and elders in poverty who are never heard in corporate and even independent media these pieces of writing and artwork are truly unlike anything else found in the corporate world of publishing today. These books allow the reader to experience and learn about the very personal struggles and resistance of each author. Poverty & Race Research Action Council (PRRAC) - A non-partisan, national, not-for-profit organization convened by major civil rights, civil liberties and anti-poverty groups. Its purpose is to link social science research to advocacy work in order to successfully address problems at the intersection of race and poverty. Practical Action - Practical answers to poverty and sustainable solutions. Race, Poverty, and Media Justice Institute - Addressing the impact of poverty, mental health treatment, media production, education, policy creation and philanthropy. Real Change (Seattle, WA) - Publishes the views of poor and homeless people and their advocates, and work to make a paper that is read by thousands of average people in Seattle. Resolution Foundation - Seeking tmprove living standards for the 15 million people in Britain on low and middle incomes. Conducts rigorous research, analysis and policy development to inform public debates and influence key decision makers in government, the private sector, and civil society. Rules, The - A global movement to bring power back to people and change the rules that keep people in poverty around the world. San Francisco Living Wage Coalition - Educates, organizes and mobilizes to demand that tax dollars and use of public property do not go to businesses that pay poverty wages. Share the World's Resources (STWR) - A non-partisan organisation campaigning for the restructuring of the global economy in order to address the root causes of poverty and inequality. Social Justice Committee (SJC) - Focusing on global causes of poverty, social injustice, and environmental degradation. Social Mobility and Child Poverty Commission (SMCPV) - Monitors the progress of government and others in improving social mobility and reducing child poverty in the United Kingdom. Supplemental Poverty Measure - At the U.S. Census Bureau, an Interagency Technical Working Group on Developing a Supplemental Poverty Measure was formed in 2009 and charged with developing a set of initial starting points to permit the Census Bureau, in cooperation with the Bureau of Labor Statistics, to produce a Supplemental Poverty Measure. The Supplemental Poverty Measure will not replace the official poverty measure and will not be used to determine eligibility for government programs. Instead, the Supplemental Poverty Measure is designed as an experimental poverty measure that defines income thresholds and resources in a manner different from the official poverty measure. TalkPoverty - A bridge between local and national voices, grassroots activism and policy work, and those who are struggling and those who are more economically secure. Dedicated to demonstrating how to dramatically reduce poverty. Here you will find basic data about poverty in America; hear from people living in poverty and people dedicated to the fight against poverty; and get involved with local, state and national organizations to take action. Tearfund - Christian action with the world's poor. Public health, including HIV/AIDS, children at risk, disaster preparedness. TimeBanks - Help organizations and communities explore and set up TimeBanking as a tool to achieve purpose and mission by putting the core values into practice. Trust for London - A charitable organisation that exists to reduce poverty and inequality in London. U.S. Census Bureau - The leading source of quality data about the people and economy of the U.S.
American FactFinder - Your source for population, housing, economic, and geographic data. Economic Census - The U.S. Government's official five-year measure of American business and the economy. It is conducted by the U.S. Census Bureau, and response is required by law. Poverty: Experimental Measures - Since the development of the current official poverty measure in the 1960's by Mollie Orshansky there have been a series of studies and reviews of the conceptual and technical elements that make up the measure. Statistical Abstract of the United States - Published since 1878, it is the authoritative and comprehensive summary of statistics on the social, political, and economic organization of the United States. United for a Fair Economy (UNITE) - Raises awareness that concentrated wealth and power undermine the economy, corrupt democracy, deepen the racial divide, and tear communities apart. United Nation's Children's Fund (UNICEF) - UNICEF maintains programs in 161 countries. Some 86 per cent of the organization's 5,594 posts are located in the field. United Nations' Special Rapporteur on Extreme Poverty and Human Rights - The Special Rapporteur is an independent expert appointed by the Human Rights Council and undertakes the following main tasks: (1) conducting research and analysis to be presented in separate thematic reports to the Human Rights Council and the General Assembly; (2) undertaking country visits and reporting on the situation in those countries in relation to the concerns of the mandate; (3) sending letters to governments and other relevant entities in situations in which violations of human rights of people living in extreme poverty are alleged to have taken place. Philip Alston is UN Special Rapporteur on extreme poverty and human rights (2014-2020). United Way Bay Area - Bring together thousands of companies, non-profits, labor unions and individuals to develop larger strategies to tackle poverty. Untours Foundation - Provides low-interest loans to people and businesses around the world to create work, housing, and Fair Trade. War on Want - Fights poverty in developing countries in partnership and solidarity with people affected by globalisation. Campaigns for workers' rights and against the root causes of global poverty, inequality and injustice. WaterAid - UK charity dedicated to the provision of safe water, sanitation and and hygiene to the world's poorest people. Welfare Law Center - Works with and on behalf of low-income people to ensure that adequate income support - public funding provided on the basis of need - is available whenever and to the extent necessary to meet basic needs and foster healthy human and family development. Welfare Watch - An information center for legislators, citizen activists, and the general public, Welfare Watch. Western Center on Law and Poverty - Leads the fight in the courts, counties and capital to secure housing, health care and a strong safety net for low-income Californians. With a focus on healthcare, affordable housing, public benefits and access to justice, its attorneys, advocates, legal services co-counsel and pro bono partners attain real-world, system-wide solutions on behalf of 8.2 million low-income Californians though class action and other impact litigation, legislative and policy advocacy, negotiations and collaborations with state and local governments and support for frontline legal aid programs. World Development Movement - A democratically-governed movement made up of local campaign groups based in towns and cities around the UK. Campaigns against the root causes of poverty and inequality. Co-ordinates hard-hitting campaigns that challenge the powerful and seek to bring about economic justice for the world's poor majority. World Food Programme (WFP) - Humanitarian organization fighting hunger worldwide, delivering food assistance in emergencies and working with communities to improve nutrition and build resilience. On any given day, WFP has 5,000 trucks, 20 ships and 70 planes on the move, delivering food and other assistance to those in most need. WFP's efforts focus on emergency assistance, relief and rehabilitation, development aid and special operations. Women's Economic Agenda Project (WEAP) - Demands economic justice for poor women and their families. WEAP assists poor women to achieve a livable wage by providing technical training, emotional support, and linkage to resources. Working Poor Families Project (WPFP) - Launched in 2002 by national philanthropic leaders who saw the need to strengthen state policies affecting these working families. The national initiative is now supported by the Annie E. Casey, Ford, Joyce and Mott foundations. Working World, The - Innovative social investment techniques that equip people with the tools to build sustainable businesses in low-income communities. World Bank: Poverty Reduction & Equity - Directory of resources supporting the alleviation of poverty. World Development Movement (WDM) - Campaigns against the root causes of poverty. Researches and develops new, positive policy options to support sustainable development. World Institute for Development Economics Research (WIDER) - Multidisciplinary research and policy analysis on structural changes affecting the living conditions of the world's poorest people. World Vision - Seeking justice for the world's poor and marginalized people. This webpage last updated on Saturday, March 9, 2019 6:26 PM.